For theatergoers who can move quickly there is a rare and limited opportunity this week at the Shetler Theatre just off Broadway. The play in question, Harold Brighouse’s comedy, Hobson’s Choice, is very close to the 100th anniversary of its premiere at the Princess Theatre here in New York on November 11, 1915. The Internet Broadway Database apologizes that the credits for that long ago production “…have not yet been completed or verified,” but suggests a possible total of 135 performances at that time. Some of those early 20th Century performances were reportedly at New York’s Comedy Theatre before the play moved on to open in London (for wartime matinees only) on June 22, 1916, during World War I. Now, at last, after that near hundred year hiatus on the stage, James Price, (in association with The Acting Studio, Inc. New York, & the Chelsea Repertory Company), is presenting this limited run of a Performance Workshop Production of Hobson’s Choice. Shrewdly directed by John Grabowski, the play sports a wonderful cast of talented players, even including Actors Equity performers, Madalyn McKay and Peter Kingsley. But the star power here is in no way limited to the Equity players. 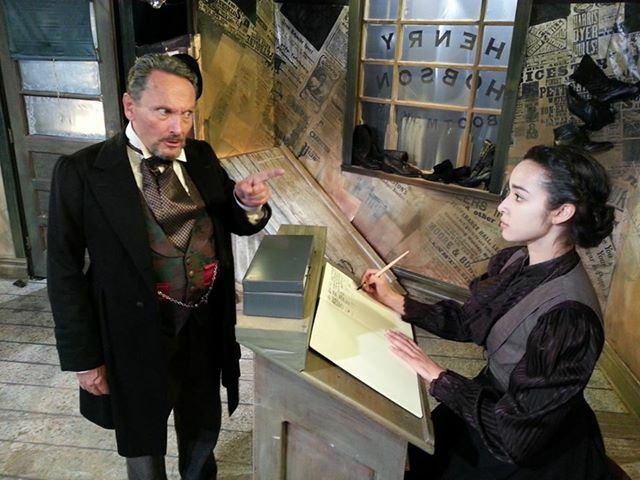 The play opens with a decidedly Dickensian atmosphere as the well-conceived scenic design of Arnold Bueso quickly transports us to the smoke filled and gritty late-nineteenth century industrial world of Salford, England. 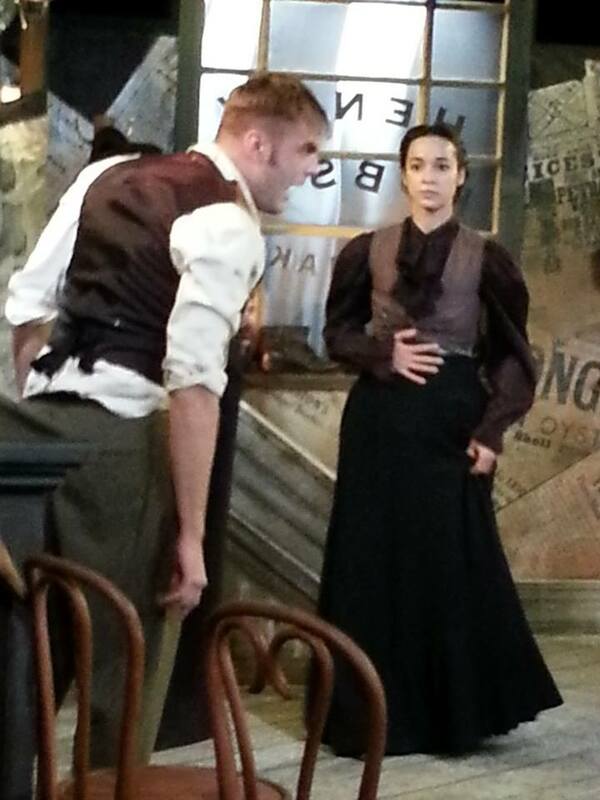 Shadowy lighting (Christina Watanabe, designer), and occasional brief and merry incidental music (Sound designer, Joseph Sebring) complement the atmosphere. We find ourselves in the shabby shop of struggling shoe manufacturer, Mr. Hobson, where the dust and grime of this mill and manufacturing town casts the scene in variations on a theme of grimy gray, only punctuated a bit by the gentle twinkle of the oil lamps. As to the “struggling” there, perhaps it is more accurate to ascribe those efforts to his three grown daughters who oversee the running of the shop. A masterful performance from Katia Thomas as the eldest of these, gives us a thirty year-old Maggie who is fiercely determined to rise above what is essentially the slave labor of her and the two more timid sisters (Vergell Bastien as Alice, and Alicia Brayboy as Vickey). Meanwhile, their pompous and rosy-nosed father prefers to drink more ale than is good for him with chums like Jim Heeler (John Zion) at the nearby Moonraker Pub, and before play’s end Hobson will be consulting with local physician, Dr. MacFarlane (Mark Coulter). Talented Mr. Kingsley arrives on the scene as the deliciously pseudo-grand authoritarian, Hobson, who takes great pleasure in barking the daily orders at his girls before heading off to the pubs. 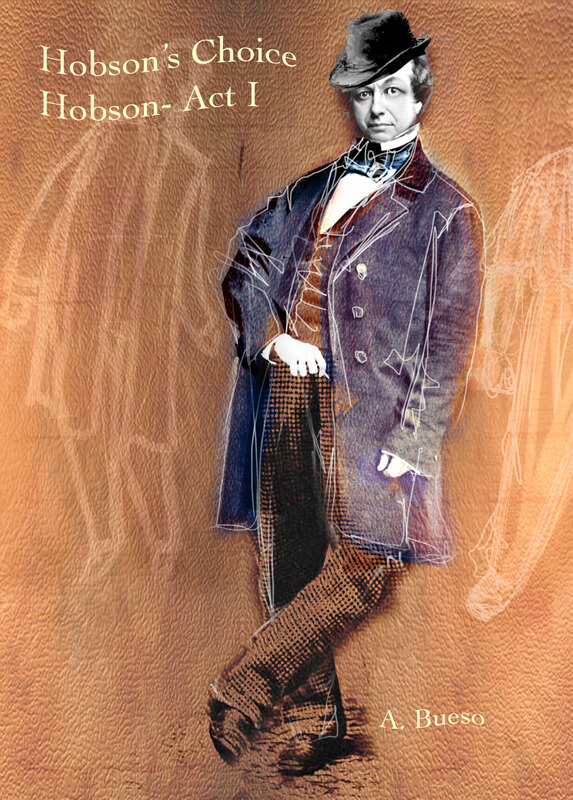 Dressed in one of the show’s many fine Victorian costumes (again, the designs of Mr. Bueso), Hobson is attired in pretentious fine style with his top hat, greatcoat, silk cravat and gold watch chain announcing his longed-for grandeur. Kingsley clearly enjoys capturing this persona, and does so with the great acting skill that some may recall from his performance in the original Broadway production of Amadeus. The amusing plot takes its first interesting turn with the arrival at the shop of wealthy and haughty Mrs. Hepworth (grandly played by Miss McKay). She is beside herself with delight over a pair of boots she had earlier acquired there, and demands to know the identity of the skilled craftsmen responsible. That, it turns out, is the humble but sweet dullard, Will Mossop (Chris Chirdon), who is always relegated to working in the shop’s basement with fellow dusty worker, Timothy “Tubby” Wadlow (Gregory Cohan). Mr. Chirdon’s sensitive portrayal of the kindly, but clearly mentally challenged Will, is a many dimensional success as Will’s shoe-crafting talent enables him to begin escaping what director Grabowski’s program notes aptly describe as, “…the tenement class, struggling to keep its grip on the bottom rung of the ladder.” Will does not by any means achieve his success alone. Maggie, who has always been the business-minded brains behind the success of the shop, cleverly engineers Will’s rise, by first convincing him to abandon his wild-eyed and whimpering girl friend, Ada (Jessica Greenwald) and to marry her instead. Realizing his eldest daughter is a central element of the shop’s success, Hobson is furious at the notion of Maggie’s marriage to this suddenly significant underling. Miss Thomas is nothing short of brilliant in the unwavering intensity she brings to Maggie’s shrewd planning for both her new life with Will, and her parallel quest of husbands for her sisters. The latter problem is solved with the arrival of young attorney, Albert Prosser (Andy Reyes) to marry Alice, and local merchant, Fred Beenstock (Brooks Russell), to wed Vickey. The clashes that follow between Hobson, his rebellious daughters and their newfound spouses would seem to make this play timely for every generation. Explosive rants from the increasingly agitated Hobson are perfectly paired with the coolly determined machinations of Maggie, while the audience can sit back and enjoy the sparks flying between such acting pros as the ever-focused Miss Thomas and the boomingly full-voiced Mr. Kingsley. One might contrast that with the many touching moments in the production when tenderness between the various players might bring a tear to the eye. Plot twists abound, but I will not a spoiler be as I urge readers to hurry to the Shetler Theatre 54 and see for themselves. 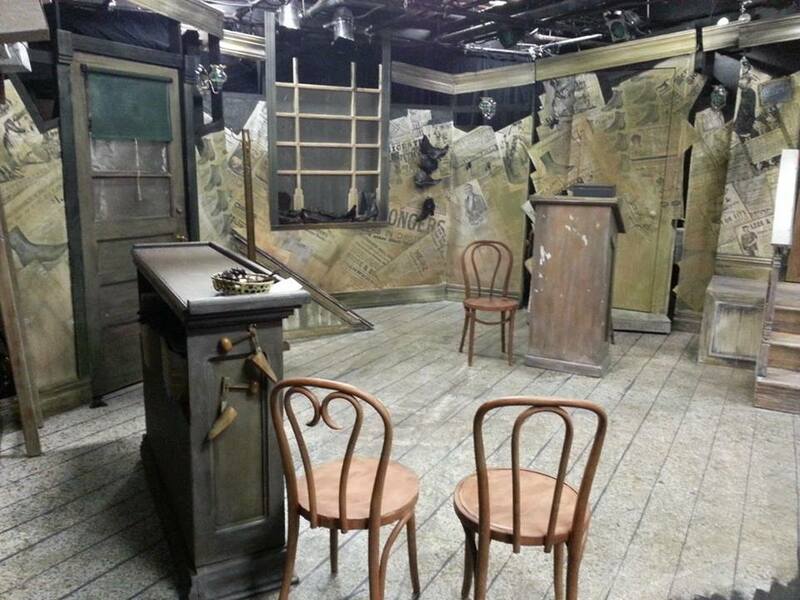 It will be worth the trip to the small twelfth floor theatre just a few steps from Broadway. This entry was posted in BroadwayStars.com, Chelsea Repertory Company, Hobson's Choice, Off Broadway, Shetler Theatre 54, The Acting Studio Inc, ThePeoplesCritic.com and tagged Broadway, Chelsea Repertory Company, Hobson's Choice, New York, Off Broadway, Shetler Theatre 54, The Acting Studio Inc. Bookmark the permalink. I remember meeting him at our table,glad he got the part. Did the whole play take place in the shop? Lovely review…nice to see someone who can appreciate the fine work that Chelsea Rep and The Acting Studio have prided themselves on for decades!!! Kudos to James Price and John Grabowski for their continued commitment to the theater arts!! !